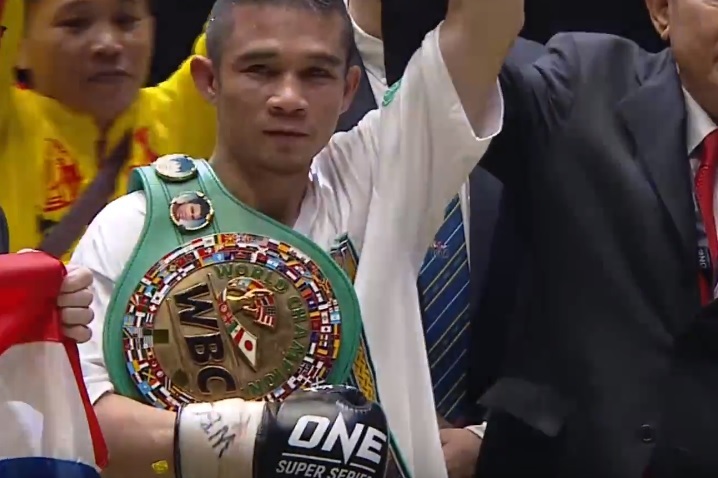 For the first time, Srisaket Sor Rungvisai, 31, of Sisaket, Thailand defended his World Boxing Council Super Flyweight World Champion belt in his home country. After 12 rounds in the cage, challenger Iran “MagnifiKO” Diaz, 28, of Ciudad Obregon, Sonora, Mexico was not able to dethrone the defending champion. On October 6, 2018, Srisaket and Diaz headlined “ONE: Kingdom of Heroes” at the Impact Arena in Bangkok. It was the first ever boxing bout in ONE Championship. Serving as the referee of the inaugural ONE Championship boxing match was championship boxing referee Jay Nady, 71. He is the uncle of former Major League Baseball outfielder Xavier Nady, 39. The judges of the 12-round boxing championship bout Richard DeCarufel, Yuji Fukuchi and Jun Bae Lim. They scored the bout 120-108, 119-109 and 119-109, respectively, all in favor of Srisaket. Winning via unanimous decision, Srisaket is still the reigning WBC Super Flyweight World Champion. It was the fourth time he successfully defended the title. Srisaket is now riding a 20-bout winning streak. The last time he lost in the ring was on May 31, 2014 when he lost to former WBC Super Flyweight Champion Carlos “The Prince” Cuadras, 30, of Mexico City, Mexico via technical decision at the Sala de Armas Agustin Melgar in Mexico City. “ONE: Kingdom of Heroes” featured 14 bouts, which included six mixed martial arts matches and eight ONE Super Series striking contests. In the co-main event of the evening, Stamp Fairtex, 20, of Pattaya, Thailand became the new ONE Super Series Kickboxing Atomweight World Champion by dethroning Kai Ting “Killer Bee” Chuang, 23, of Chinese Taipei.